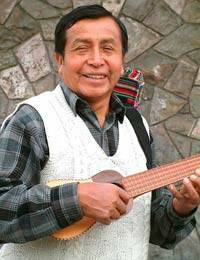 Dionisio Quilla crafts a beautiful quena flute, an instrument dating to the Inca Empire. Quena means 'many-holed object' in the Quechua language. It is said to have entranced birds to soar above its player, which may be no wonder given that early versions the quena were fashioned from condor bone. Quilla crafts this piece from diablo fuerte or yellow wood and paints it by hand. It includes a bright fabric carrying case. 37 cm H x 2.8 cm Diam.